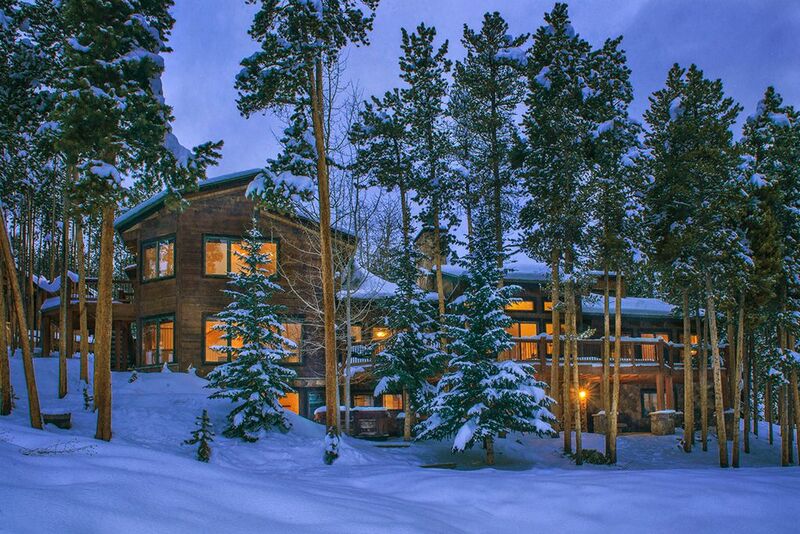 One of the most popular rental homes in The Breckenridge Ski Resort! SKI IN, SKI OUT on Peak 8! Summer time Hike and Bike out the door! This classic private home is filled with character! You'll capture splashes of Oregon and Pennsylvania Architecture here! 'The Slopeside Lodge' continues to host families, large and small groups, corporate retreats, wedding guests, and reunions...'Slopeside' is one of our most popular homes and reserves quickly..... Winter and Summer! Located on Four O'Clock Ski Run and gateway to The Timber Trail Neighborhood, we are SKI-IN and OUT! With plenty of space; you can sit in front of one of three fireplaces, watch movies (10 televisions),Cook a glorious meal; (dining area for 20), shoot a game of pool or play games in the family room, take a hot tub under the stars or just relax and enjoy the gorgeous views of Baldy Mountain. You are IN the ski area and a little more than 1 mile from downtown Breckenridge! The summer offers hiking right out the door; exceptional views, and a quiet street! Spotted at Slopeside: Bear, moose, fox, deer, elk, raccoon, cool looking birds... even a porcupine. If you need MORE space; JanesLodges offers more homes in the area! Discount when you book multiple homes for the same period of time! Born and raised in Pittsburgh, Pennsylvania; I moved to Breckenridge, Colorado to start 'Jane's Lodges' with my Dad. We have been in operation for 28 years! Started annual Family Ski Trips to Breckenridge when I was 15! We still do one every year! The Slopeside Lodge was our first vacation rental purchase in Breckenridge. The lodge is upgraded continuously and has become a favorite and annual vacation home to families across the U.S. The Slopeside Lodge sits at the Base of one of the newest high-end neighborhood; Timber Trail....... You know what they say..... "Location, Location, Location !!!" Living in Breckenridge is magical..... if you can spend just a week here; you will definitely experience a little piece of paradise in the Rocky Mountains! We try to create each lodge to exude all of the mountain comforts you would look for while vacationing in our town! The Slopeside Lodge is located within the Resort Community of Breckenridge. Walk to the T-Bar Bar at the Base of Peak 8; and One Ski Hill. Walk to the Gondola if you would like. Ski In and Out. In-floor radiant heat; electric heat. Plenty of linens, plush blankets, down comforters, quality duvets and quilts. Plenty of bath towels, wash cloths, and hand towels for each bathroom. Hot Tub Towels are also provided. An Eat-In Kitchen area seating up to 10 people A Dining Room adjacent to this seating an additional 12 people. Private Outside patio location. Great views of Baldy Mountain from the tub! 3 levels of great well-designed space, 3 Fireplaces, Phones, 10 Cable TVs, WiFi Internet, VCRs and DVD players, Stereos with CD players, Outdoor Hot Tub, Dishwashers, Fully appointed Kitchen, Washers, Dryers, Comfy Flannel Linens (winter), comfortable down bedding and plenty of towels and hot tub towels provided, Propane grill, Billiards, Games, Bar, 2 Living Rooms, 2 Dining Rooms, SKI-IN/SKI-OUT, Ski Room, Views of Baldy Mountain, 3 Decks, 2 patios, Sledding adjacent to the house.